In the early 1970s, a seemingly ubiquitous LP of The Planets, conducted by William Steinberg, put the new Deutsche Grammophon-Boston Symphony relationship "on the map" for numerous listeners. The performance was first-class, with Steinberg, in his too-brief Boston tenure, revitalizing an ensemble that had lost its zip under Erich Leinsdorf's tepid stewardship. The ensemble's association with the score was further reinforced by two subsequent recordings, on Philips: one with John Williams conducting the Boston Pops, the other the present performance, with the full Symphony. 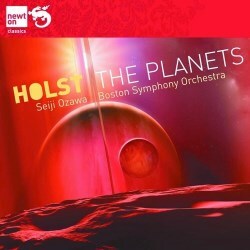 The Planets would seem to be the sort of virtuoso showpiece at which Seiji Ozawa excelled, given his superior skills at orchestral traffic management. This score requires character and precision — not always Ozawa hallmarks — as well as virtuosity. The Boston Symphony always sounds beautiful, though a few fumbled balances and smudged woodwind attacks have been permitted to pass. More critically, the interpretive intent is rarely clear. The one movement that comes off brilliantly is Jupiter. The opening blazes; the outer sections are hearty, with an infectious swagger; the central anthem sings with full-throated fervour. The climaxes are unequivocally thrilling, even if, in the tutti at 2:19, the tripping trombone obbligato is slightly buried. Uranus is nearly as good, with deft "handoffs" from one instrument to the next in the pointillistic bits. At 2:39, the tubas clip their pickups but this is corrected as the other players take up the motif. After the climactic tutti-with-organ chord, the string chord that follows at 4:18 is unusually pure. The other movements, while handsomely played, variously fall short. Ozawa emulates Steinberg's driving tempo in Mars — an unequivocal break with the heavier British tradition — but doesn't recapture his bristling intensity. The lower brasses chop up the motif at 1:21: to understand what's missing, listen to how the basses "phrase through" the same motif at 3:04. Venus, despite shimmering high violins in the central section, is chilly; granted, the composer tagged her as "the Bringer of Peace," not of Love but surely she shouldn't sound so detached about it. Nor is Mercury sufficiently mercurial: fast enough, but sometimes self-consciously careful. Ozawa's Saturn runs a full minute longer than Steinberg's. The difference is not in the trombone chorale, which has a comparably steady tread but in the surrounding passages where the additional time adds little else. Finally, Neptune, after a quiet start, sounds much too close and healthy. Without some sense of distancing and atmosphere, the movement sounds pointless. Headphone listening betrays a few splices, though you may not notice the one, say, at 4:32 of Uranus over speakers. There's also a throat-clearing during a quiet patch of Venus. Newton Classics doesn't proffer session specifics, but lists a publication date of 1980. This sounds like I'm heading for a recommendation of the Steinberg account, but there's a snag. That earlier recording, spectacular as it was, was apparently the product of an elaborate mixdown, and its digital transfer, while vivid, sounds, literally, synthetic: the strings sound as if they were played on a synthesizer. Ozawa's strings, conversely, register with a bewitching, silky warmth within a rich, deep sonic frame. So, if you want to luxuriate in the Boston string sound, Ozawa's recording is the unexpected preference. If you'd just as soon leave Boston altogether to experience the cosmos, the older Philips recording with Haitink and the London Philharmonic retains its sonic lustre after some four decades.